Tachometer/RPM II. - Jose Pino's Projects and Tidbits. As many people was asking for another version of the tachometer to measure up to 9,999 revolutions per minute (RPM), I decided to create an improved version specially used for automoviles or any other machine that can't reach more than 9,999 RPM. The original version was created to measure the RPM of electrical motors with high accuracy with a range between 60 to 99,990 RPM. This improved version measures between 200 to 9,999 RPM with a 0.3% 97% of accuracy. I do not recommend to use this project for critical applications. Please read the disclaimer at the main page. Pin 4 is the signal input, you can use optical sensors (Fototransistors, fotoresistors, etc), magnetic sensors (Hall effect, reed switch, etc) or using a switch. Unfortunately, I have no idea how to connect this circuit to a vehicle. If you want to share details about how to attach this circuit to an automovile, I will post this information. DO NOT CONNECT ANY SIGNAL DIRECTLY TO PIN 4. High voltages can damage the PIC. If the input signal is more than 5 Volts, Use a driver as TTL, CMOS, Amp Operational or Transistors. 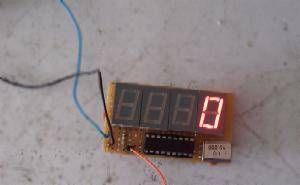 The RPM are displayed as units, that means, the RPM indicated in the display is the actual reading from the input pin. This version have a faster sample rate so the reading is constantly updated, you get a faster reading that the previous version. The schematic is the same. Download the HEX code HERE Right click and "save as..."
NOTE: Use only 10Mhz xtal and 22pf or 33pf capacitors. Here is a picture of the prototype during testing and calibration The input signal was 3,600 RPM. Please note red displays works better than green or the yellow ones. Do you want to know how this tachometer works? Here is the algorithm. I had a serious data loss back in 2006, many files were lost. Sorry for the inconvenience. In case you ask, I did develop this project almost 10 years ago. I did use JAL & assembler to create this project. Thanks for getting back. I put it aside but last night I found out what the problem is. The clock must be set to HS and not XT for a 10 mHz xtal. Not having the source file made it rather difficult to find that as the original one must have been set correctly. Changing the #2 to XT prevents the 10 mHz xtal from oscillating. Francisco Arroyo Garcia sent this photo of his tachometer, a very compact design.